Bourke's parakeets are an excellent introductory bird for those new to the hookbill pet bird species, both for their calm demeanor as well as their ability to entertain themselves. They are quiet birds that are ideal apartment dwellers and are equally suited for individual cages or small aviaries, where they are excellent partners for finches and cockatiels as well as other Bourke's parakeets. However, due to their passive nature, Bourke's parakeets should be kept away from larger, aggressive birds. Also known as Bourke's parrots, or simply Bourkies, these birds are named for Sir Richard Bourke, who was governor of Australia's New South Wales territory between 1831 and 1837. Other common names include blue-vented parrot and sundown parrot. Bourke's parakeet has a variety of other common names, including Bourke's parrot, the blue-vented parrot, the sundown parrot, or the pink-bellied parrot. The taxonomical name for Bourke's parakeet is Neopsephotus bourkii. It was originally classified as part of the Neophema genus but was assigned to its own genus in the 1990s. Bourke's parakeet is a nomadic species native to Australia, which is the only place on earth they're found in the wild. Their habitat spans much of the continent of Australia, including Queensland, New South Wales, central, southern, and western Australia. The principal habitat is dry plains, but the bird can also be found in native cypress and eucalyptus woodlands. Wild birds are sometimes found in urban areas, as well. Successful captive breeding programs have made Bourke's parakeets popular pets in homes all over the world. This species is in no way threatened; wild populations seem to be actually growing. Bourke's parakeets are small to medium-sized birds, measuring between 7 and 8 inches in length from the beak to the ends of the tail feathers. Healthy Bourke's parakeets weigh slightly less than 2 ounces once they are fully grown. Like other Australian parrots, Bourke's parakeets living in captivity have relatively long lives, with many living as long as 25 years. Known as a very sweet, gentle, and good-natured species, Bourke's parakeets make good pets when hand-fed as babies, which allows them to bond with their human caretakers. These are intelligent birds but are also mellow and quiet, especially compared to other parrot species. Peak activity usually occurs just after sunrise and sunset, when they can get a bit noisy, though not annoyingly so. Overall, these are relatively quiet birds when compared to other parrots. Unlike other parrots, Bourke's parakeets do not talk or perform tricks. While they're not as vividly colored as some species, Bourke's parakeets are still quite eye-catching. They have a dusty brown tint to their plumage, with pink feathers covering their chests and abdomens, and blue tail feathers. The backs of their wings display a darker brownish-gray hue, with each feather highlighted by a lighter-colored outline. The sexes can be distinguished visually—they are sexually dimorphic. The adult male has a blue forehead while the adult female has little or no blue on the forehead. The male also tends to be slightly larger than the female. A number of color mutations are possible with Bourke's parakeets. 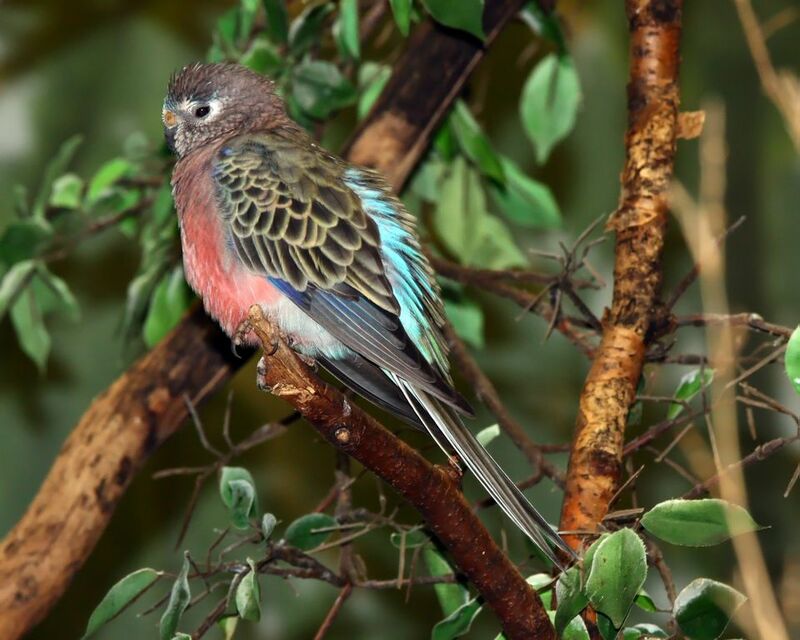 One of the most popular is the rosy Bourke's parakeet, which a bright shade of pink. Bourke's parakeets are not commonly sold at pet stores; more often, you'll need to seek out a breeder. These birds are not given up by their owners as often as other, more difficult pet birds, but it is still worth a call to rescue organizations and animal shelters to see if there are birds available for adoption. These birds are enthusiastic flyers, so they are better suited for roomy aviaries rather than cages. The best aviary is at least 6 feet in length, with several tree branches for the birds to climb. If an aviary is not a practical possibility, choose the largest cage possible, with dimensions that are wider than they are tall, as these birds enjoy horizontal flight. A bare minimum is a cage 3 feet long, 1 1/2 feet wide, and 1 1/2 feet tall. These birds are best suited to be caged in pairs with another Bourke's parakeet, although they can do fine alone, provided you have plenty of time to interact with them. Swings are a good addition to an aviary or cage. Bourke's parakeets are enthusiastic bathers, so make sure to keep bathing pools inside the cage or aviary. Make sure the bathing water is clean and cool. Another weekly shower-bath with a spray bottle filled with lukewarm water will be an enjoyable experience for your bird. Parakeets are extremely social birds, and Bourke's parakeet is no exception. Although less demanding than some other species, your bird needs at least an hour or two of interaction and training each day. Bourke's parakeets fall into the category of "grass parakeets," which means that in the wild they forage for food among the fields and plains. Wild Bourke's parakeets consume a diet based mainly on seed, grasses, and other plant matter, supplemented with fruits, berries, insects, and other types of food when available. To properly feed a pet Bourke's parakeet in captivity, owners should offer their birds a small parrot seed mix meant for budgies and birds of similar size. This diet should be supplemented daily with a variety of fresh fruits and vegetables to provide the bird with balanced nutrition. Bourke's parakeets are less active than most other parakeets, but it's recommended they receive between 2 to 3 hours outside of the cage daily, in a supervised play area. These birds like long horizontal flights, so try to provide an environment that allows for this. Your Bourke's parakeet will enjoy plenty of toys, so offer both commercial plastic toys with bells and bright colors, as well as ordinary household items to gnaw on, such as cardboard egg cartons. Like other parrot species, Bourke's parakeet can be prone to Psittaci disease, which can be spread between birds and even to humans. The disease causes obvious respiratory problems and is treated with antibiotics. A number of viruses can also strike parakeets, causing problems such as abnormal feathers, diarrhea, and pneumonia. Parakeets are also prone to sinus congestion caused by the Aspergillus fungus; good nutrition and hygiene will prevent this problem. A number of parasites can affect parakeets. Intestinal parasites may cause a bird to lose weight and become depressed, while external mites and lice will cause the bird to scratch and lose feathers. If this description of Bourke's parakeet interests you, look into some other pet bird species such as Indian ring-neck parakeets, budgies, and parrotlets.